MurileeMartin.com » Blog Archive » Greatest LeMons Candidate of All Time Bought By Speedycop! Yes, after LeMons Chief Perp Lamm announced a waiver of entry fees (and the LeMons Supreme Court announced that we’d suspend budgetary disbelief) for this fine race car, LeMons Legend and double IOE winner Speedycop lurched into action. How will he get it from Iowa to Maryland? How will he keep his neighbors from running him out of town with pitchforks-and-torches rage when they see this thing show up? What’s his wife going to say when she finds out? They don’t call him “Clearly Stark Raving Mad And Going Into The Poorhouse” for nothing! Let me be the first to point out that this monstrosity will need video once it groans into action. This is the worst/best thing to ever happen to LeMons. Anything powering this other than 2 engines, preferably either both rotary or one rotary and one small block will just not be right. I’m torn. It’s awesome that Speedycop won the auction and this thing is going racing, but I happen to know one of the guys that he was bidding against, and had that person won, the car would have still made it to LeMons, and I would have gotten to drive the beast. 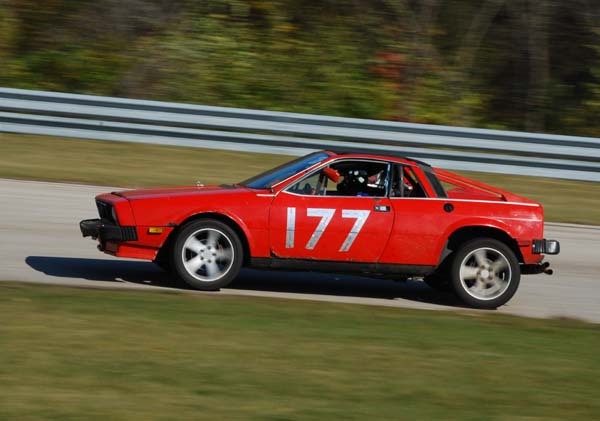 The aforementioned bidder was my crew chief, and the real reason that the Double Jeopardy Fiero made such a valiant attempt to keep racking up laps with ever fewer cylinders. He informed me of his intention to bid on it this past weekend. So I’m disappointed that my crew chief didn’t win it, but I look forward to seeing it turn some laps at the hands of Team Police Brutality. Someone needs to make a documentary about this car racing in Lemons! The trick will be getting Sly Stallone and David Carradine to appear on the team. Surely this is cheating. Two of everything means it will be twice as reliable! To compensate, I think they should be forced to have two drivers, each with steering for one axle, throttle for one engine and control of half of the brakes. As one of the future hopeful drivers of this thing, I am speechless. As was my girlfriend when I showed her a picture of the thing. I think her first question was if I had life insurance. Jeff, we’ll be driving through around Christmas. Any chance we might pop by for a visit? This is a huge leap forward for rolling chicane technology. When are where will the next Lemons be? Thanks in advance. BTW, is this where All Jalops Go when we die? Whether its PCH(ell) or PCH(eaven) is left as an exercise for the reader. Two rotarys connected with the correct E-shaft timing can be a potent little machine. Worst case scenario even if the engines are stock 12a’s with the correct exhaust and intake setup can push 400hp to the flywheel. This will be awesome! 12 A’s they are, with Dellorto carbs, Racing Beat intakes, and one MSD box and coil PER plug. W/ 2 rotaries, 20 Lb/ft torque!